Bring home a sweet baby girl doll with the Welcome to the World Baby Doll by Award-Winning Master Doll Artist Sandy Faber, exclusively from The Ashton-Drake Galleries. This lifelike 18 inch doll comes to life with RealTouch® vinyl and is hand-painted to look So Truly Real®, from her gently furrowed brow and supple fingers to her tiny wrinkled feet. 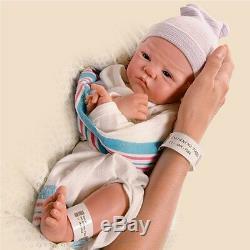 Baby is fully poseable and perfectly weighted to feel so real in your arms. Arrives with a hospital band that you can personalize with a name that's most meaningful to you. As you watch her sleep, you wonder: how is it possible to love anyone so much? But as you gaze at her precious face, and marvel at those ten tiny fingers and ten little toes, you realize that this darling girl, this amazing blessing, has captured all your love. Now, you can bring home this little sweetie with the Baby of Mine Baby Doll, exclusively from The Ashton-Drake Galleries. This lifelike fully poseable baby doll is So Truly Real® and is brought to life through the unique talents of Master Doll Artist Violet Parker. Handcrafted of RealTouch® vinyl skin to create all the lifelike detail, this adorable baby doll is 17 inches of cuteness and is weighted to feel amazingly real in your arms. Wisps of hair and feather-light lashes add to the realism. Plus, this precious baby doll wears a custom bubble outfit accented with ruffles and ribbon, and swimming across the bodice is a mother whale and her baby spouting tiny hearts, to melt yours! Strong demand is expected, so order now! This precious baby doll wears a custom bubble outfit accented with ruffles and ribbon, and swimming across the bodice is a mother whale and her baby spouting tiny hearts, to melt yours. Measures 17 L; 43.2 cm L. New never been out of the box. The item "Welcome to the World Baby Girl Doll By The Ashton-Drake Galleries" is in sale since Tuesday, December 18, 2018.